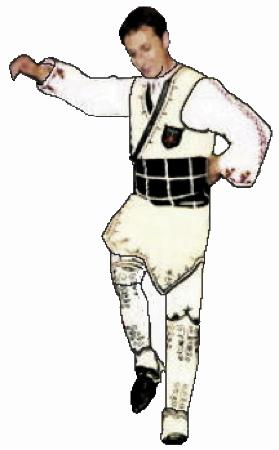 Information: Petre (Peter) I. Petrov, teacher of Bulgarian folk dance. A native of Bulgaria, Peter is an accomplished dance choreographer, teacher, and performer. Founder and Artistic Director of the "Ludo Mlado Dance Ensemble" in 2002, his goal is to make Bulgarian folk dance and music accessible to a wider audience. Prior to his departure for the United States, Peter was dancing professionally with “Rodopa” State Folk Dance Ensemble. Since the age of seven he has danced with numerous school ensembles many of which won outstanding awards in city-wide and national-international competitions. Since arriving in America in 1993, Peter has taught many classes and workshops throughout the United States. His first major appearance as a choreographer and dancer in United States was in 1994 during the opening ceremony of soccer's World Cup with Chicago-based folk dance group "Balkanski Igre" representing his native country, Bulgaria. 1967  April 24, Born, Bulgaria. 1988-1992  Solo dancer in National Ensemble "Rodopa" one of the top four National Ensembles in Bulgaria. 1987-1992  Graduated from Musical Academy, Plovdiv, Bulgaria with specialty of folk dancing and choreography. 1986-1988  Founder and Director of the folk dance group "Zdravetz" Bulgaria. 1981-1986  Dancer in the top High school folk ensemble. 1993-Present  Director of Folk dance group "KOLO," Dancer at the Folk Ensemble "MANDALA" Boston, Workshops throughout the United States. 1994-Present  Peter and his groups have participated in a wide range of dance festivals throughout the United States. FOLK ART CENTER of New England, Inc. I am writing to express my support for Petre Petrov's application to the INS for permanent residence in the United States. Petre, through his work as a dance instructor, event organizer, and, indeed, cultural "ambassador" for Bulgaria is without parallel in this country. Unlike so many other talented dance leaders, Petre is not a revivalist  he is teaching that which he has lived and studied. Other teachers and musicians may visit from Bulgaria, bringing samples of their culture with them; the opportunity to have Petre here permanently would be unique, and fill an important void in the artistic tapestry within the United States. Petre's dedication is three-pronged: 1) to share and spread the joy of his native country's dance through exemplary teaching; 2) to educate children and adults alike about his culture; and 3) to promote awareness and tolerance of a culture far from our borders and experience. Not only is Petre teaching Americans about Bulgaria, but he is also teaching second-generation Bulgarian children about their own cultural roots, thereby keeping their ethnic identity intact. The United States is blessed with a wide variety of immigrants who have brought aspects of their cultures with them. Petre is the only native Bulgarian of whom we are aware who is adding his knowledge and abilities to this rich multicultural mix. If Petre were not allowed to stay, we would lose an invaluable "window" into the Bulgarian culture. Any average person who is from another country does not necessarily deserve consideration from the INS. Petre's qualifications, however, put him far above and beyond the average. He has graduated from the Higher Institute of Music and Education in Plovdiv with a major in choreography, arguably the best institution of its kind. He has a degree in pedagogy and advanced training in dance and the arts. As we no doubt have all experienced, someone with exemplary talents in a particular field of expertise cannot necessarily teach it to others. Petre has a unique ability to both teach and perform dance from his native country. In addition, Petre incorporates the values of inclusion, tolerance, and cooperation among diverse peoples through his teaching, making him one of the few people in his profession to further social awareness. If you have any other questions about Petre, his work or his abilities, please do not hesitate to get in touch with me. Meanwhile, we as part of the community which Petre serves, will waft with hope that his application is approved. As General Manager of the Boston International Festival, I wish to express my support for the National Interest petition of Mr. Petre Petrov based upon my collaboration with Mr. Petrov relative to his participation in two annual Festivals as a representative of Bulgarian/Balkan music and dance traditions. He will participate in the upcoming Festival to be held in October at the Bayside Exposition Center in Boston. I first became acquainted with Mr. Petrov personally through his work on behalf of the exhibition and performance representing Bulgaria at the 1996 Festival, in which he demonstrated the musical and dance traditions of Bulgaria and the Balkans in performance of the highest professional quality. His contributions were substantive and significant and did much to promote appreciation for his cultural and ethnic traditions among those attending the Festival. The Boston International Festival represents an important forum for the education and exposure of Americans to the rich tradition of the world's arts and culture. Each year for the past seven years, the International Festival has provided a unique opportunity for intercultural education and exploration. Over 100 countries were represented in last year's program which was attended by some 80,000 people. In fact, the Boston International Festival represents the single largest school field-trip destination in the United States, hosting some 400 schools-representing approximately 40,000 students and teachers from all over the Northeast. These children are presented with a vast array of cultural activities, exhibitions and performances which encourage appreciation and respect for the cultural diversity both of the world and of the United States, where, as in the case of Bulgarian-Americans, Serbian-Americans, Croatian-Americans, Albanian-Americans and others, the world's cultures find a second home. In this light, I think is obvious that Mr. Petrov's contributions to the national interest are substantial, dramatic and significant. I know of no other dancer in the tradition of Bulgaria and the Balkans who has the expertise and impact on the community that Mr. Petrov possesses. Mr. Petrov is a uniquely valuable asset to the Boston International Festival in that he comes from an established professional dance background, and is at the same time an experienced and trained teacher. He is thus an excellent communicator of his traditions, capable of reaching audiences on multiple levels. Moreover, his extensive volunteer work, both at the Boston International Festival and in many other forums, is indicative of his generous contributions to the cultural enrichment of this country. It is on the basis of these contributions that I would urge your approval of his Petition. In my position, I am especially aware and daily reminded of how much this country owes to the talents and dedication of individuals such as Mr. Petrov in creating and strengthening our multicultural society. All material used by permission of Petre Petrov. Thank you so much for your support and for the video tape, it was so nice for me to see Toma Karapaunov teaching dances  reminds me of my years in Rodopa. I do have the Report to Members 1998 issue and I will give it to my lawyer. The patition is going well considering the legal laws, but now INS has a own interpretation of the law so from now on everything is in God's hands. I am so excited about your electronic Folk Dance Encyclopedia. This is one step forward to give the people more and foster information. You have my permission to include the letter of recommendation. Best to you and Tatiana.